A bogged-out skidder road after a major woodcut. I’ve been sitting on this post a long time, in part because I haven’t known how to write it up. A couple of years ago, I wrote this manuscript and submitted it to two different peer-review journals (in series, not in parallel) as a sort of commentary piece. The first outlet rejected it with a brief but polite review. With the second, the editor offered to publish it, pending major corrections to incorporate changes a game reviewer had suggested. I thanked the ed for his interest, then withdrew the piece. Now I’m pinning it here, to this would-be bulletin board, and starting a new category, “unpublished”, that I hope not to use too often. Because plans for large-scale landscape preservation in the US do not rely exclusively on lands held in trust, conservation programs have a vested interest in forest stewardship by private landowners. Selective harvests for commercial sale are often highlighted as a financial incentive for owners of non-industrial “family forests” to sustainably maintain the working character of their acreage rather than subdivide it or convert it for development. However, the business costs inherent in even a small-scale commercial timber harvest typically mean that forest parcels smaller than approximately 80 acres are too small to support a financial return. Statistics for private forest ownership in the U.S. suggest this minimum scale makes commercial harvest incentives effectively inaccessible to more than 90% of forest owners. Rural landscape conservation and commercial timber harvests depend on the same economies of scale to be viable. Designs for regional-scale forest conservation need to account for non-industrial but nonetheless commercial economies of scale that set an inherent limit on financial incentives intended to foster stewardship activity among family-forest landowners. 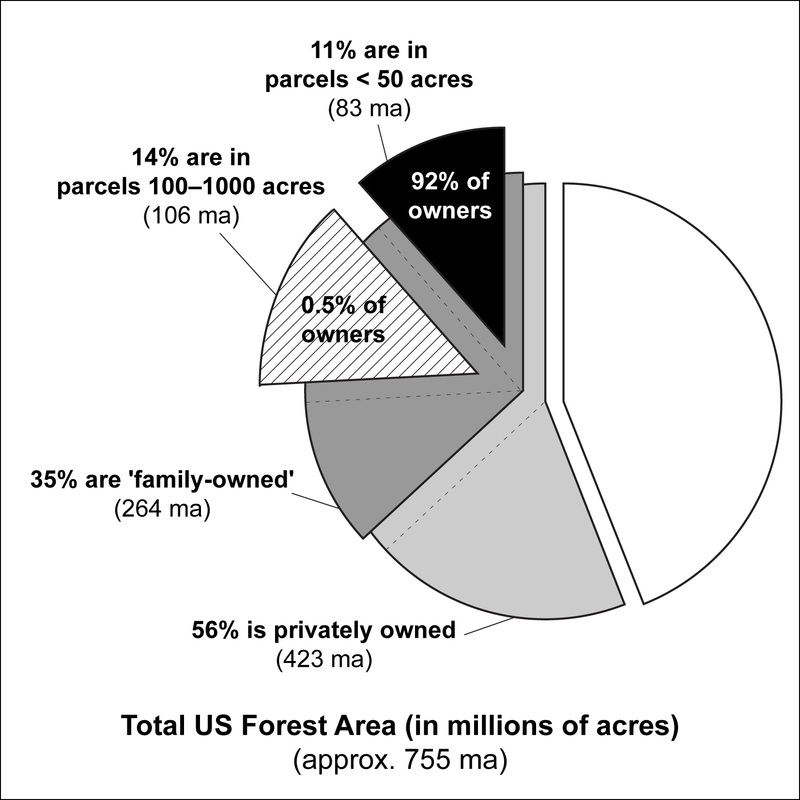 Key subcategories of forest subdivision and ownership in the US, using data compiled from Butler (2008). Of all privately owned, non-industrial forest land, 11% is in parcels smaller than 50 acres (black wedge), and therefore below the minimum size typically necessary to support a commercial harvest. This acreage category accounts for 90% of all private forest land owners. I wrote this piece because the subject is something I care about. I have a vested interest in it. I grew up on an unusually productive (high-grade), mixed-species, 30-acre woodlot that’s been cut selectively three times in my life (in the interest of full disclosure, I missed the first cut by a year or two), overseen each time by the same forester (who co-authored the manuscript), and twice by the same logger (a one-man, one-skidder operation). Technically, my family is among the 90% of forest owners (Fig. 1) for whom commercial harvest should, by the numbers, be inaccessible. I also care because I’ve seen a lot of woodlots flipped for development back home. Hence the question I still can’t answer: is there any land use of financial value to a land-owner – cash-on-the-nailhead value – that can trump the financial incentive of development? Scholarship on small-scale and “family” forestry suggests there are a lot of options. While I have the utmost respect for campaigns like Wildlands & Woodlands, I’m afraid I remain skeptical about the real alternatives available to the 90%. It’s one thing if your little plot sits on a watershed of value to a conservation interest. But what if you can’t sell to a trust, and can’t afford to set up a stand-alone conservation easement? What if the timber quality’s poor or middling at best, but you want to leave it wooded? Forestry literature is full of social surveys that expound the many virtues of woodlot ownership, highlighting all the rewards that aren’t financial – the pleasure of manual labor, of environmental stewardship however humble, of working outdoors. If I’d been polled, I’d have expounded them too. But the non-financial benefits of a small woodlot can quickly scatter in the face of immediate financial need. If you’re too small to harvest for commercial sale, you’re probably too small to retain as a conservation asset. But almost never are you too small to subdivide. I pulled the submission because I couldn’t answer two primary questions posed in peer-review: Who cares if 90% of homeowners are left out of landscape conservation agendas? (If their plots are too small, isn’t it a case of what’s done is done?) And if we did care, what kind of policy instruments should be out there to do something about it? In fact, aren’t there already a number of conservation instruments for family forests? So what’s the matter with them? This manuscript falls into a gap between two audiences. To conservationists, the subcategory of smallholdings actually amounts to not much – 11% of non-industrial US forest land. Speaking of economy of scale, imagine a campaign to organize such a huge constituency to conserve so little (in relative terms) and such diffuse physical space. The economy-of-scale argument is obvious – these properties, however many of them there are, are too small to save. Likewise, forestry disciplines aren’t interested because economy-of-scale in commercial forestry practices isn’t news. So, for now, the audience is me, mourning the blighting of rural landscapes. And maybe you, if you’re still reading. Economy of scale is surely a key fulcrum in the dynamical relationship between conservation and development (and, for that matter, between other competing uses for a given resource). I’ll embed it in future work, somewhere – perhaps in an agent-based model of land-use change (which I’ve attempted before), or similar (with some inspiration from ecology). Please call me before you subdivide. POSTSCRIPT (14 Jan 2015) – After I posted this, friend&colleague Evan Goldstein suggested I upload this manuscript to PeerJ PrePrints. So I did. It now has a (citable) DOI, and is out there in an Internet world that’s wider than this bloggy one. Check out the re-routed link above.